Saut set out under a clear morning sky after packing his camp up and forcing down a few stiff pieces of preserved venison. He made good progress on Lark; she didn’t need to be pressed, and rather seemed to enjoy the ride after lounging around in camp for a few days. Winter wrens and chickadees, encouraged by the (relative) warmth of the day, sang and called cheerfully from a nearby copse of trees as Saut drew up to Inferni’s old western border. He inhaled deeply, searching for any fresh coyote scent in the breeze. Then he dismounted, hitched his mare to a low tree out of the open, and trotted on four paws into the Wastes. Nearer to the ground, Saut was able to pick up signs that canines had crisscrossed the area recently, but he didn’t recognize any of the scents. This part of the territory had always been foreboding, and empty-feeling, and now more than ever the landscape felt distinctly harsh. The grey hybrid turned uncertainly in the direction of the Mansion’s ruins. He considered calling out – if the respondent was unfriendly, he could always just outrun them – and settled on a mid-distance bark that would not carry out of the area. Saut was much changed since the last time he’d walked these paths, now grown over in places with thorny plants and weeds. His fur had lightened, and he’d become a little more proportionate, though he would always be ungainly. He moved without the invented burdens of his childhood and paused every so often to appreciate a familiar landmark, or birdsong (fainter, here) or the sun. Maybe he was more prone to distraction, too, but Saut wasn’t hurried. He doubted he would find anything but ghosts out here, anyway. The two ravens were playing in the snow. Clover always liked the black birds well enough -- they had been such an important part of Inferni culture -- but she never truly understood them like Vesper did. She knew they were mischievous and had personalities just like coyotes did, but there was something strange about seeing them play like this. More than hopping and warbling and tugging tails, they were perching on hills and rocks covered in snow and sliding down them, on their backs, landing with acrobatic turns and cackles and flying back up again to suggest it was all on purpose. The next time the smaller raven, Speedy, tumbled into the snow beside Clover, the dog picked her muzzle up off her paws and lolled her tongue in laughter. Curled up beneath one of the scraggly trees overhanging Grimwell, her nose tucked in her bushy tail, Vesper smiled; Clover could see it for the squinting of her blue eyes. It was an expression Clover liked to see, though she realized that Vesper was smiling at her rather than the antics of her birds. She smiled back, then put her muzzle back on her paws, self-conscious. Her tail swished in the snow behind her. A solid week had passed since they first settled down in old Inferni territory, and while Clover knew the ache would never go away, she had finally accepted Otilie's death and that grieving for longer would help no one. There were other things to focus on now, like ensuring that Vesper remained fed and healthy with one less hunter providing meals. They had traveled a long way from the Eastern Realms, but Clover didn't know where their journey might end. She sighed. Speedy flew back up the hill, then abruptly zipped up to the top branches of the tree, which swayed under his weight. He cawed loudly, and Stormeye -- Ves' other bird with the one cloudy eye -- flapped up to join her mate. Both began to make a racket, and Clover quickly jumped up onto the limestone outcropping, anticipating the worst. They were close to Salsola, after all. The figure jogging across the moor was lanky and long-muzzled, but the greys and tans of his fur were very familiar to Clover. When it came closer, she realized she recognized the doggish face, too, and her tail wagged. "Saut?" she called out, head cocked. She heard scrambling in the snow behind her and realized that Vesper was trying to climb the rock, too. 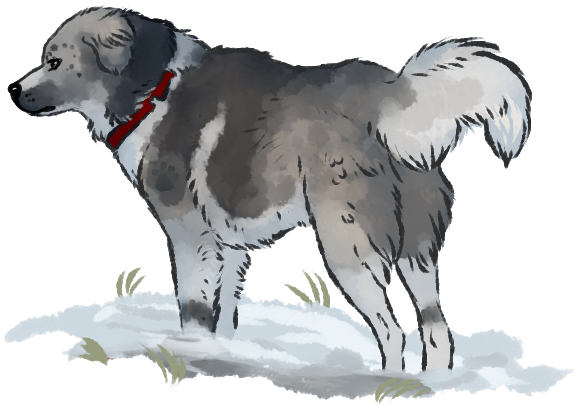 Clover quickly dipped to grab some of the old coywolf's grey scruff in her neck, hauling her up beside her. Vesper stared at the mongrel Asylum with wide eyes. Saut had his nose down an entrance to an old rabbit warren – abandoned, unfortunately – when he heard the ravens. His head jerked out of the hole and his amber sights sought the source of the racket. Just able to see the dipping and swaying of branches in a distant tree against the sunlight, Saut squinted and trotted in that direction. Inferni’s ravens had originally been a source of annoyance for the coymongrel, though this mostly stemmed from his own inability to communicate with them. Even though one of them eventually took a shine to him, and he begrudgingly to her, Saut hadn’t had the slightest wish to attempt to bond with any “wild” ravens after he left. Claptrap, he assumed, had simply forgotten him. Still, there was a decent chance these birds had belonged to the group, even if there was a discernible lack of black wings in the sky above old Inferni. Regardless, they were alarmed by him or by something on the other side of the nearby outcropping of boulders, and Saut wanted to know what it was. Saut? The monochrome hybrid’s attention was jolted to the top of the outcropping, where a couple of silhouettes stood in the sun, watching him. He half-jumped into a wider stance, tail wagging rapidly as he recognized Clover’s bulky, rounded features and beside her the smaller, one-eared form of Vesper. Saut sped towards the outcropping, ears fanned backwards. “Clover? Aunt Ves?” he returned as he slowed near the base of the boulders. He balanced on his hind legs for a moment to get a better look at them and catch their scent. He hadn’t really expected to find anyone, much less “family.” “I’ve been looking for you,” he breathed, warm and relieved, into the cold air. Pebbles and muddy snow rolled down the boulders behind him as he clumsily made his way up to them. Saut leaped onto a boulder a few feet away from the pair. Vesper looked much aged since he’d last seen her, and she hadn’t been all that youthful then, either. She had a tired look in her eyes, and so many scars he couldn’t remember which ones he’d seen before. Clover still covered herself in ash as the western coyotes had done, and she seemed relatively well. Tired, too. Tail still wagging, but held low, Saut took a step closer, wanting to greet them but unsure how he’d be received. Saut was unmistakable as he rushed toward the limestone outcropping, his large ruddy ears slicked back and his long legs stretching over the hard moorland earth. He was older, more filled into his lanky frame, but he hadn't seemed to have changed much – at least comparatively. Clover had witnessed the transformation of many friends and family over the last few harsh seasons, smiling faces grown thin and haggard, sunken eyes losing hope. Vesper and Clover had not been spared this metamorphosis, but the sight of the Lykoi brought smiles to their faces. Clover's tail waved in the air behind her as she shuffled to make room for Saut to climb onto the boulder beside them, sniffing in his direction. Vesper's scarred face was twisted with more emotion, but she surely felt something stronger at Saut's return. Whereas he was an intriguing, admired acquaintance of Clover (who had been enthralled by another with such doggish blood in the clan), Vesper saw her former mate's family, and a small puppy who she'd teased for wandering out into the village with the sniffles. It's good to see you, the old coywolf said, her voice quiet and rough, and crossed the distance to nuzzle him fondly. She pressed her cold nose into his fur, breathing in his scent, while Clover sat down and watched. Above, the ravens muttered to each other, but sensing that all was well flapped away from the branch, raining down frost. Clover chewed on her inner cheek, thinking a moment. Have you been okay? she asked, and added more uncertainly, You heard what happened? So very much had happened. She couldn't quite recall when he'd left the clan – but it was sometime before the series of disasters that would be Inferni's final, fatal wounding. By now rumors would have spread between loners and pack scouts that the coyotes had scattered, but there was often a twist in the telling. Saut met Vesper’s gaze and just caught the warmth in her expression before she pressed close to him. He returned the “embrace,” ducking to give a happy nibble to the fur under one of her ears. The familiarity of her scent, tinged as it was by the odor of winter austerity, sent the coymongrel’s memory into a shallow spiral back to his earliest days. He stared past the pale landscape beyond Vesper and saw Kaena’s eyes, mirrors of his own (still blue, then), and the sandy tones of his Aunt Myrika reaching out to him. Nearby was another living shape, a little wilder, but no less safe-feeling. “I’m sorry,” he said huskily, knowing it was too simple a statement for all that had evidently transpired since he’d been gone. The coymongrel couldn’t speak for the universe in all its cool indifference, but he believed he had let the former Aquilla down when he’d drifted away - not that he’d offered Inferni much before he’d left. Vesper pressed in a little closer at Saut's murmur, her eyes squeezed tighter. She did not know if it was an apology or an expression of sympathy, but she had heard – and said – the same words over and over since Inferni suffered its mortal wound. She didn't reply, even though Saut was blameless in the whole thing, because she did not seem to trust herself to speak. It was with a little reluctance she let the boy (it was hard to think of him as anything but a boy) draw away, the void left behind filled with cold. Watching them, Clover breathed a low sigh then nodded at Saut's response. She didn't wish ill on any of the clan who had left before the fall; she was glad that they had been spared the same pain she'd had to suffer through. There was only one person she wished could have been there to see everything transpire, but she felt that she'd spoken her very last words to Jehan months ago. The thought made her shoulders tense up, but she rolled them back and relaxed forcefully – for a time. No matter how many times she recounted the tale, she didn't think she could explain Inferni's war and its eventual downfall without her hackles rising. Yeah. Salsola attacked us. It was a simplification of what had happened. She glanced at Vesper, but the old woman was staring at Saut, her expression hard to read. We were at war, and they burned down the mansion with many of us inside of it. A pang went through her at the memory of Cartier's body, how heavy it had been when she dragged it free of the flames. Vicira took over and moved us to the old territory, but the place... It couldn't feed us. And eventually it was all too much. We were gonna die if we didn't go our separate ways. Vitriol threatened to creep into her voice, but Clover was careful with the words she chose, especially with the former Aquila sitting there. She never wanted to blame Vesper, even if the old coywolf had made many mistakes in her time. Vesper had never abandoned the clan, though. She would have rather died, Clover knew. Everything terrible or misguided that she had done had been for the sake of Inferni and her family. The back of Saut’s throat burned as Clover laid out the specifics of Inferni’s downfall. He shut his eyes after mention of the burnt mansion and let his head dip under the weight of all the rest. What a horrible choice. Saut wondered what had happened to Vicira, but he couldn’t bring himself to ask her mother. She wasn’t here; none of Vesper’s children or grandchildren were. Just the silvery dog before him. 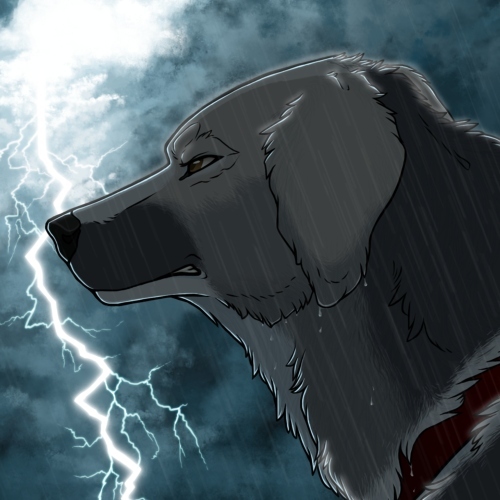 The coymongrel’s nose wrinkled as thoughts about loyalty and family flashed through his mind, but it faded quickly. He had learned that this was the way of wilder coyotes – frequent goodbyes and utilitarian intersections. Clover was right. Alone or in small groups, more Infernians would survive than if they remained together for a wolfish notion of civic duty. Saut sat in silence for a minute or so after Clover finished speaking, letting fresh tides of grief wash through him. “So you came back here,” he said, finally. “What for? This place isn’t much of anything without its people, either.” He jerked his nose to his right and quickly scanned the emptiness, though he grudgingly knew there was abundant life to be found here, still, even in winter. Perhaps the territory would even become richer, for a time, without so many hunters patrolling it. A stray cloud drifted in front of the sun and rendered the landscape considerably grayer, punctuating Saut’s words. “I found a place,” he said with a searching glance at Vesper. “It’s far, but maybe that would be a good thing.” She might even already be aware of Sonnerie, if she knew half of Myrika's family had lived there for so long. It's familiar, Clover said, following the point of Saut's long nose to the grey moor: scraggly grass, broken hills, scattered stones. Might not be much, but I know how to hunt here. We didn't plan on staying long, though. It was dangerous to squat in a territory that bordered Salsola's claim; for all she knew, the murderers would seek them out and finish the job they'd begun months ago. Her brown eyes returned to Saut curiously when he mentioned "a place," but though Vesper looked at him with the same consideration, she gave her ragged pelt a shake. I'm not sure how far I can even go, kid, she admitted. Part of their reluctance in abandoning the burned lands was Vesper's condition; arthritis ached her already scarred and broken body, and hours of travel took days sometimes. On good days, they covered nice ground -- but cold, rainy winter mornings rendered her unable to leave her den. Is it a place with other folk? Clover asked, lifting her brows. Would they welcome... us? A mongrel dog and an old hybrid down on their luck -- more of a liability than an asset at this point. Clover could be useful, she could work, but she wouldn't leave Vesper's side even for a lifetime of feasts and comfort.